How can you help prevent sea t urtle disorientations due to beachfront lighting? Understand and follow the requirements of your city or county lighting ordinances. 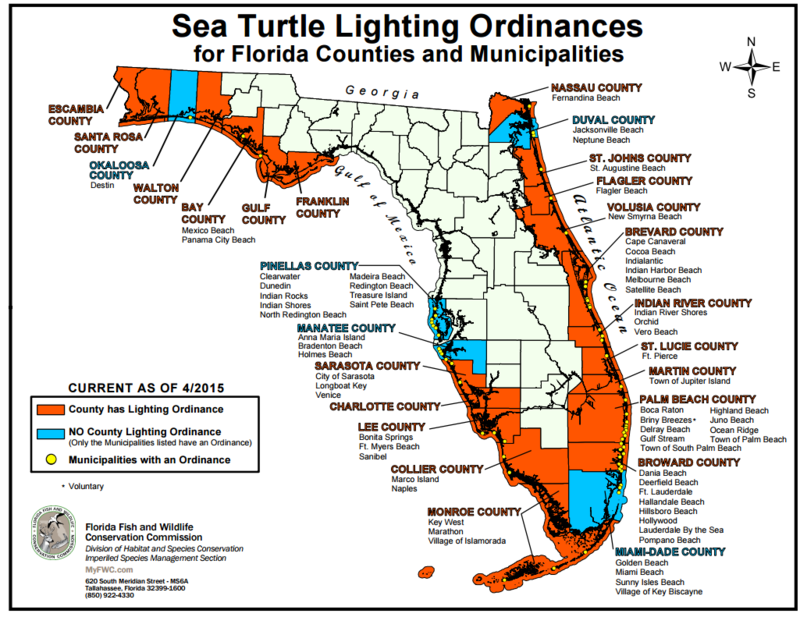 Many ordinances encourage residents to turn off beachfront lights during sea turtle nesting season. To read your coastal community’s ordinance, click here. See right for a map from FWC illustrating all of the current lighting ordinances in Florida. Go out to the beach at night and identify what lights on your property are visible from the beach. If the lights are not needed for safety, simply turn them off. If the lights cannot be turned off, shield, redirect or lower the height of the lights so they are no longer visible from the beach. Replace problematic lights with sea turtle friendly fixtures designed to direct light where you need it and away from the beach. To find examples of sea-turtle friendly fixtures, click here. Use red or amber LED bulbs (which are less disruptive to nesting sea turtles and hatchlings), in shielded, downward-directed turtle friendly fixtures. Reduce interior lighting problems by applying window tint at a 15% light transmittance level or close opaque curtains or blinds after dark to reduce the amount of visible light reaching the beach. Only light for safety and avoid decorative or uplights during the nesting & hatchling season. Place security lighting on motion-sensors. When choosing lighting for your coastal property, please remember these three simple rules: Keep it low, keep it shielded, and keep it long. If you live in Bay, Okaloosa, Santa Rosa or Escambia counties and are interested in retrofitting your beachfront property, call the Sea Turtle Conservancy at 352-373-6441.